Because what else is there to do while you have too many caregivers for one patient? A tonsillectomy etc for the son really did not require for so many of us to spend so much time at his home, but we did. There really was a limit to how much Shark Week and Headline News and accompanying commentary I could stand while the boy slept. Did I mention that he is thirty-two, and completely capable of caring for himself? We could tell he was ready for some time to himself by the time we all left. In addition to Taki's surgical adventure, we have had a great deal of other life stuff in the mix. From babies to big kids, and from animals to other mostly routine medical stuff, we have been more than a little busy and preoccupied. Of course, that is the stuff of life, and we are all hanging in there. 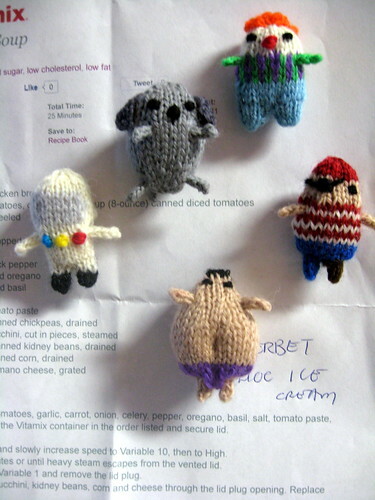 That has not left much time or concentration for Celestarium, so I knit these tiny refrigerator magnets for Taki. I liked knitting them, they were a nice distraction, and were not too demanding. When I was able to knit the last three in one day, I knew it was time to be home. That being said, we will be back to help him a bit this week, but really, only as much as he needs. We will see how well he does with a ride in the car and a trip to the store and take things from there. This week looks to be another big one, and I am going to do my best to take it a day at a time at most. I hope everyone else has a good week. What are you all up to these days?